La Joya Independent School District is committed to providing Educational Excellence through rigor, relevance, relationships and personal responsibility. We are the integral part of learning where students become successful and productive contributors to our global society. We embrace, with passion, the commitment to continuous improvement, collaboration and accountability that will allow our students to imprint the world. 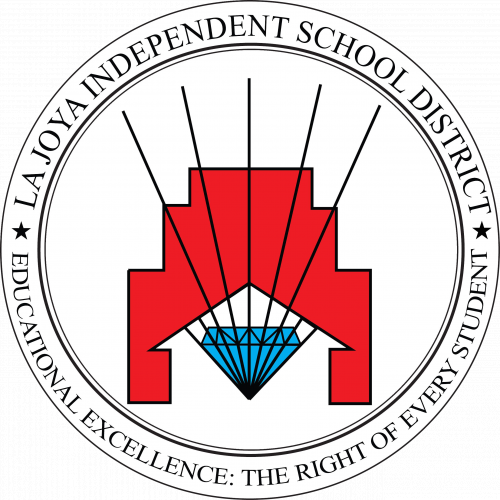 La Joya Independent School District is dedicated to the belief that in order for all students to attain mastery of the instructional goals, there must be a district-wide commitment to constant renewal according to the most effective practices and procedures in the most current research findings. In order to operationalize this philosophy in the most comprehensive and organized manner, the district has adopted The Quality District Model. The district’s Mission Statement, Foundation Beliefs and Desired Exit Behaviors: Student Learner Outcomes, exemplify this philosophy. The La Joya Independent School District operates from the vision statement that “Educational Excellence is the Right of Every Student.” This position demands that every adult in the organization will act purposefully to create conditions for every student to receive maximum educational services. We believe all students will learn given sufficient time and appropriate support. We believe schools control all of the variables that influence student success. The task of schools is to alter the learning environment to provide conditions for success. We believe the manner in which students view themselves will have a direct impact on their success. Therefore, one of our most significant roles is to intentionally enhance students’ view of themselves as learners and worthwhile persons. We believe all pupils have unique skills and talents. Our task is to identify them and nurture their development. We believe any artificial grouping, which places pupils in situations where learning expectations and opportunities are automatically limited, is not acceptable. We believe all pupils can acquire critical learning skills and understand at higher cognitive levels. We believe students proficient in a language other than English are empowered through their first language. We believe the role of the teacher is that of advocate. All adversarial relationships need to be eliminated. We believe students will be more successful when learning experiences are relevant. We believe all of our professional behaviors need to be intentionally aligned with the most recent research regarding teaching, learning and individual behavior. We believe the learning process is an open experience with no mysteries or surprises. The curriculum, the teaching process, and the assessment will be clear to students at all times. We believe a pupil’s rate of learning does not determine the success of the learner. We believe all students should be provided all skills necessary to graduate college, career and workforce ready. We believe state of the art technology should be integrated into the lives of students to enhance their learning and prepare them for the 21st century. We believe our role is to instill in students the values of hard work, honesty, commitment to excellence, courage, self-discipline and perseverance. We believe educators should equip and empower families to help support their children and ensure their success in school and in life. All students will successfully master the essential basic skills. All students will exit as self-directed learners. All students will learn how to learn. All students will leave with their self-esteem intact. 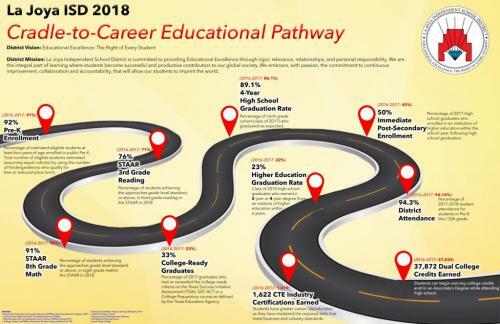 All students will graduate college, career, and/or work force ready. By achieving these goals La Joya Independent School District will transform into a community of learners, set academic and behavioral expectations, and create a culture where children feel special and safe. Goal 1- The district will implement a rigorous curriculum and instruction program to close achievement gaps to ensure that all students reach their academic potential. Demonstrate sustained improvement in all core areas. Provide technology application skills to promote 21st Century learning. Promote the Fine Arts, Athletics, UIL Academics, and Career & Technical Education to support instructional programs. Promote and cultivate a college and career readiness culture. Provide professional development to increase student performance and develop teacher effectiveness. Goal 2- The district will implement student support services that address the total well-being of each student by providing a safe and secure school environment. 2.1 Implement the policies in the District Code of Conduct and Student Handbook. 2.2 Provide individualized counseling and health related services. 2.4 Minimize the drop-out rate and increase the graduation rate. 2.5 Recruit, develop and retain a highly-qualified instructional staff. Goal 3- The district will provide an administrative and finance system that supports student achievement. 3.1 Allocate the resources to support the instructional goals and objectives of campuses and the school district. 3.2 Finance and maintain the purchase, construction, renovation and expansion of facilities. 3.3 Safe guard district resources. 3.4 Promote leadership opportunities and build capacity for teacher, administrators, parents and community members. 3.5 Promote, embrace and support meaningful community involvement in the overall success of students.